After reading last month’s “Let’s Write a Web Extension,” I was inspired to try and port a real-world add-on to a WebExtension. 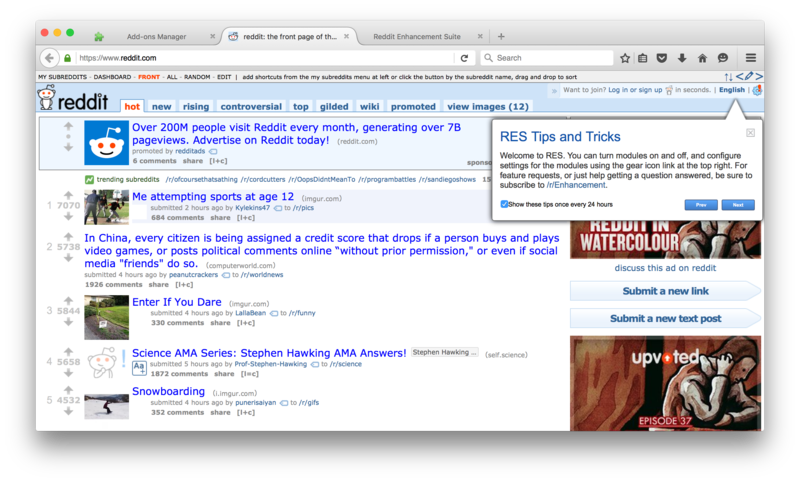 Specifically, I tried to port the Chrome version of the popular, open-source “Reddit Enhancement Suite” (RES) to Firefox. Here’s what I learned, and what you can do today to prepare your own add-ons for the transition. Note: The authors of RES are excited about WebExtensions and plan to officially port their add-on, but this is not that. If you want to use RES, you should install the supported version from AMO. First, I want to stress that WebExtensions are a long-term, multi-year project. Our first releases will be focused on building a foundation of basic, well-supported, cross-browser APIs. This means that it may take a while before we’re ready to support complex add-ons that rely on unique browser features, but we’ll get there eventually. Because everything here is still very early and experimental, you’ll need to use a Nightly build of Firefox if you want to follow along. This is a sneak peek, not something you should plan on deploying. That said, if you have a Chrome extension or a cross-browser add-on, now is a great time to experiment with WebExtensions and provide feedback. Your input will be crucial in helping Mozilla figure out which APIs to prioritize and initially support. Download and install a Nightly build of Firefox. Create a new profile for testing and development. Visit about:config and set xpinstall.signatures.required to false. Set "YOUR_ADDON_ID" to a made-up string formatted like "ext@example.org". If you plan on directly upgrading your users from an existing Firefox add-on to a WebExtension version of the same, you should re-use the value found in the "id" field of your package.json. The next step is to compare the keys in your manifest.json to the ones that Firefox supports. Unsupported keys are ignored, so you can leave them in your manifest until we get around to implementing them, at which point they should Just Work. Looking at Reddit Enhancement Suite’s manifest, we’re in pretty good shape. The metadata attributes are all implemented, and there’s sufficient support for background, content_scripts, and web_accessible_resources to work with RES. options_page: We’re OK without this since RES also injects a link to its settings via content_scripts, rather than solely relying on the options_page property. page_action: We’re OK here, too. RES only uses the page action as a shortcut for toggling a checkbox that it injects into pages via content_scripts. permissions: All of the permissions that RES requests are supported except for history, which hasn’t been implemented yet. RES only uses the history API to mark links as visited when previewing images inline from an “expando” button. Missing this means a slight degradation in functionality, but nothing catastrophic. optional_permissions: We don’t yet support optional permissions, which for RES means we won’t support embedding inline previews from Twitter or OneDrive via expando buttons. Unfortunate, but not a showstopper. At this point, I’m feeling pretty good about our prospects. Most of the APIs we need are supported, and we should be able to deliver most of RES’s functionality despite the handful of missing APIs. Since we’ve identified some gaps in Firefox’s API coverage relative to our needs, it’s time to head to Bugzilla. Filing and voting for bugs are two of the most important contributions you can make as an add-on developer. In addition to keeping you informed of progress, it helps us judge which APIs are the most important to implement. Since I’m writing this article, I’ve gone ahead and made sure bugs were filed for the above APIs. Feel free to CC yourself on these bugs if you want to be notified of their progress, or click the little “vote” link next to the “Importance” field if the bug is particularly important to you. If you need to file a WebExtension bug, please file it against the “WebExtensions” component in the “Toolkit” product, and tag it with the “dev-doc-needed” keyword. This link should pre-fill all the right fields: File a WebExtension Bug. Before diving into the code, let’s head back to Bugzilla and make sure bugs have been filed for these. The bugs mentioned above cover History, Page Actions, and Permissions, but they don’t cover tabs.getCurrent. I’ve filed Bug 1212890 for that. This keeps the script from blowing up, but it means that addURLToHistory will silently fail until Bug 1208334 gets resolved. Under certain circumstances, like with RES, this might be acceptable. If it’s not, you’ll need to find a creative workaround or wait for the relevant bug to get resolved. Remember: file and vote on bugs! It’s how we know what we need to work on. Page actions are another great example: while it’s handy to have a button in the browser’s UI, you may also be able to provide the same functionality by using content scripts to inject custom UI into target pages until Bug 1197422 is fixed. Lastly, we could get around the lack of permissions.request() by moving all of the optional_permissions from our manifest.json up into the normal permissions block. That would work, but it’s best not to require more permission than you need, and changing the permissions stanza generally results in your users being prompted to re-authorize your add-on. If possible, just wait for Bug 1197420. Zip your files so that your manifest.json is at the root of the zip file. Rename it from .zip to .xpi. Drag and drop your XPI onto the page. Click “Install” in the prompt. 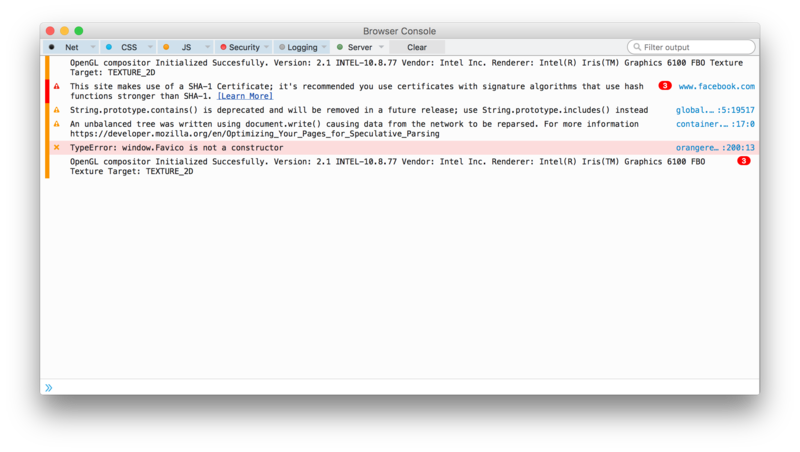 If anything goes wrong, check out the packaging and installation docs on MDN for troubleshooting tips. Despite WebExtensions being a brand new initiative at Mozilla, we’ve already implemented most of the building blocks needed to support the Reddit Enhancement Suite. Things should work, as long as we’ve properly routed around unsupported API calls. …no dice. :( So, what went wrong? To find out what failed, we need to open up the Browser Console. It’s a global log of everything that happens in the browser, and it’s where uncaught exceptions from WebExtensions show up. It’s in the Developer menu. Note: Though they are related, the Browser Console is not the same thing as the Web Console in that menu. The root cause of the bug is that the Favico library exports itself as this.Favico in its content script, and RES assumes that it will then be available as window.Favico in other scripts. It turns out that Firefox doesn’t work the same way. Off to Bugzilla to file Bug 1208775! Fortunately, there’s an easy workaround: just omit the window. part. This gets us past that error and results in working infinite scrolling. Hooray! Also, kudos to RES for fixing this in pull request #2465! Of course, we’re not done yet. There are many other fascinating and hilarious bugs to be found, like Bug 1208874, which prevents RES from saving any of your settings because WebExtension localStorage is getting nuked every time the browser restarts. Boo! Remember: Keep your Browser Console open and file bugs when you find them! As I mentioned at the beginning of the article, WebExtensions are still very early in their development, and things are rapidly changing. For example, PageAction support should land any day now. That said, WebExtensions are already astonishingly capable. For add-ons like RES that isolate and minimize browser-specific code, a port to WebExtensions is surprisingly close to being viable on Nightly builds of Firefox. We’re still several months out from any of this landing in mainline Firefox, but it’s encouraging to see rapid progress. Each day we’re closer to a future in which a single add-on codebase can be fully re-used across many browsers, and where add-ons are written using the same technology as the Web itself. If you want to follow along with the bugs that are blocking a port of RES to WebExtensions, CC yourself on the RES metabug at Bug 1208765 and check out my own attempt at porting RES on GitHub. For now there are 123 WebExtensions bugs opened, but only 21 have an assignee. It does not bode well for the future of Firefox add-ons. That mainly speaks to how recent this initiative is within Mozilla: lots of bugs get filed up front when a new project starts. Keep your eye on it, I think you’ll be pleasantly surprised at our pace. Exciting to see the progress on WebExtensions. Keep it up. is there any scaffolding for web extensions ? something like jpm for current addons generations ? Not yet, but there will be once WebExtensions are ready for widespread use.